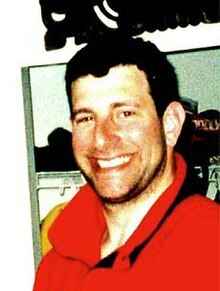 Jeremy Logan Glick (September 3, 1970 – September 11, 2001) was a passenger on board United Airlines Flight 93, which was hijacked and crashed as part of the September 11 attacks. Aware of the earlier attacks at the World Trade Center, Glick and some of his fellow passengers attempted to foil the hijacking. During a struggle to reclaim the aircraft, it crashed into a field in Stonycreek Township near Shanksville, Pennsylvania, killing all 33 passengers and seven crew members on board. Glick was born into a Jewish family and had five siblings, all of whose names begin with the letter "J". He was a middle child among the six children of his family. He grew up in Saddle River, New Jersey and attended Saddle River Day School. He and his high school sweetheart, Lyzbeth, were prom king and queen in 1988. Glick was an American National Collegiate Judo champion while he was a student at the University of Rochester in Rochester, New York, where he was president of the Rochester chapter of the Alpha Delta Phi fraternity. He later worked as a sales and marketing executive for Vividence, an e-consulting company in San Mateo, California. Glick also played rugby at the University of Rochester where he was a team Captain. On August 31, 1996, Glick married Lyzbeth. The couple had a daughter, Emerson, born on June 18, 2001, whom they named after author Ralph Waldo Emerson. Glick was a resident of West Milford, New Jersey. According to accounts of cell phone conversations, Glick, along with Todd Beamer, Mark Bingham and Tom Burnett, formed a plan to take the plane back from the hijackers, and led other passengers in this effort. Glick's last words to his wife when aboard Flight 93 were: "We're going to rush the hijackers." He then hung up the phone. Co-workers and family stated that they were not surprised that Glick took action. Glick's brother-in-law Douglas Hurwitt said, "that was my brother-in-law. He was a take-charge guy." Glick's former boss, Thomas Torf, added: "He was a no-nonsense kind of guy. He took ownership of things. Very focused. He loved his family. He was a good businessman. All of us loved him." Glick's name is located on Panel S-67 of the National September 11 Memorial's South Pool, along with those of other passengers of Flight 93. Glick's name on the Wall of Names at Flight 93 National Memorial in Pennsylvania. Glick's sister, Joanna Glick, who finished tenth in the 2001 Junior National Amateur Figure Skating competition, skated a tribute to her brother at a benefit at Madison Square Garden, for which she received a standing ovation. Joanna, who was profiled in Joe McNally's portrait book, Faces of Ground Zero, said of her brother: "He was so strong. I was thinking I should be strong too. Jeremy lives in our hearts. Love, freedom and bravery live on forever." Glick was awarded the Arthur Ashe Courage Award in 2002. West Milford, New Jersey honored Glick by naming the Jeremy Glick Trail, and the vista, Jeremy Glick's Overlooks, after him. ^ Atkins, Stephen E. (2011). The 9/11 Encyclopedia: Second Edition. ABC-CLIO. p. 208. ^ Bernstein, Richard (September 24, 2013). Out of the Blue: A Narrative of September 11, 2001. Times Books. p. 1971. Google Books. Retrieved December 2, 2013. ^ Stephen E. Atkins. The 9/11 Encyclopedia: Second Edition. p. 208. ISBN 1598849212. Retrieved December 13, 2017. ^ 9/11 Flight 93 Victim Jeremy Glick Family Interview On Dateline. YouTube. November 14, 2011. ^ "Passenger: Jeremy Glick". Pittsburgh Post-Gazette. October 28, 2001. ^ "Jennifer Glick: Jeremy's Heroes foundation commemorates brother" Archived 2008-02-29 at the Wayback Machine. CNN. November 9, 2001. ^ Goff, Alex (September 10, 2011). "A Hole in the Sky, and our Hearts" Archived 2013-09-22 at the Wayback Machine. RugbyMag.com. ^ "Unexpected legacy left by hero of Flight 93". Yahoo! News. September 2, 2011. ^ a b Tyrangel, Josh; Cloud, John; Poniewozik, James; Orecklin, Michele; Morse, Jodie; Ripley, Amanda; Martens, Ellin (September 24, 2001). "Facing the End". Time. ^ "Jeremy Glick". United Heroes. Retrieved September 12, 2013. ^ South Pool: Panel S-67: Jeremy Logan Glick Archived 2013-07-27 at the Wayback Machine. Memorial Guide: National 9/11 Memorial. Retrieved October 28, 2011. ^ "SAR presents medals, flag in Somerset ceremony" Archived 2007-11-24 at the Wayback Machine. Pittsburgh Tribune-Review. September 15, 2002. ^ "Flight 93 passengers selected for Ashe Award". ESPY Awards. July 24, 2002. Retrieved 2009-09-21. ^ Vick, Jon (Fall 2007). "Xaipe, The Newsletter of The Alpha Delta Phi" (PDF). Alpha Delta Phi Fraternity. p. 1. Retrieved September 11, 2016. ^ Zimmer, David M. (December 5, 2011). "West Milford Enviro. Commission soliciting input on trails master plan". NorthJersey.com. ^ "Jeremy Glicks Overlooks Hike". Monmouth County Park System. Retrieved May 3, 2012. ^ Weise, Don. "North Of The Tension Line". NJSkylands.com. Retrieved May 3, 2012. Wikimedia Commons has media related to Jeremy Glick. McGraw, Seamus (September 20, 2001). "A Hero's Death". Jewish Journal. This page was last edited on 5 March 2019, at 07:29 (UTC).